The grey squirrel (Sciurus carolinensis) is found throughout England, Wales and parts of Scotland. It was introduced between 1876 and 1930 from the States/Canada, probably on a number of occasions. In many parts of the UK they have displaced the native Red Squirrel. Grey squirrels eat an amazing variety of food – bark, buds, flowers, nuts, berries, seeds and fruit from many different species of shrubs and trees (and therein lies the problem). They will also eat insects and fungi, and will on occasions eat bird eggs or even fledglings. Squirrels are known for collecting and storing nuts in the ground. They do not remember where they put them, they rely on scent to find the stored nuts and of course, there are many that they do not find so aiding the dispersal of seeds from parent trees. Broadleaved woodland can support some 8 to 18 squirrels per hectare, but the density of squirrels is much less in coniferous woodland. Grey squirrels damage trees by gnawing at the stem to get to the sweet, sap filled layers (phloem tissue) just beneath the bark. This tissue is responsible for the movement of sugars around the plant (known as translocation). If this gnawing extends around the stem so the tree is ‘ringed’ i.e a complete circle of bark and underlying tissue is removed, then the movement of sugars around the plant will come to a halt and the tree will die. Removal of any bark and associated tissue will check or restrict the growth of trees. This bark stripping occurs between late April and the end of July. Very young trees or saplings (stem diameter less than 5 cm) are generally not attacked as they cannot support the weight of a squirrel, the main stem of older trees (40 years+) are usually safe as the bark is too thick for the squirrels to strip. The most vulnerable trees are sycamore, beech, oak, sweet chestnut, pine, larch and Norway spruce, aged between 10 and 40 years old; though almost any broadleaved species of tree can be attacked. Bark stripping is a problem in woodland where the squirrel numbers are greater than 5 squirrels per hectare. The risk of damage may be greatest where there are vulnerable trees next to mature woodland that produces a good seed crop, which in turn supports a high density of squirrels. Control of squirrel numbers is difficult. 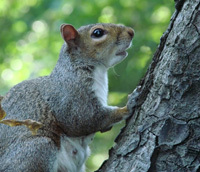 Control aims to reduce tree damage by bringing the number of squirrels to below 5 per hectare. However, it is important to remember that grey squirrels are highly mobile as a species and a non-isolated woodland can be re-colonised within a month; and even one that is isolated will have new resident squirrels within three months. Control measures should aim to ensure that the number of squirrels is at a minimum when bark stripping activity is at a maximum. Details of trapping and control procedures can be found here. There is presently an initiative to reduce the numbers of grey squirrels in England. The cull is being organised by DEFRA and the Forestry Commission, and will run for three years. In the longer term, the possible control of grey squirrels through immuno-contraception or the use of a genetically engineered bacterium or virus is discussed in another Forestry Commission paper. I have 4 hazel trees, about 7 years old. They are loaded with immature nuts now, this year. All the white parts of the nuts are exposed, some split in half, again with jab holes in the white substance. We have seen 1 grey squirrel only, but I guess they get up earlier than we do!! Could somebody please comment or advise, please? In the absence of any info. about treating trees that have been stripped, I am going to protect the bare areas of a 35 year old Thuya by smearing them with yellow soft paraffin. I’ve dealt with the squirrels and they only return in manageable waves. The tree seems to be OK only time will tell. The article clearly outlines the fact that manually reducing numbers is ineffective – even if, like Reece Fowler said, it takes over a year – yet no one here seems to have noticed that the only information provided is with regards to going out and actively killing them. I suggest that anyone with a large area of land and a serious problem considers the reintroduction of pine martens. Trials have proven to be amazingly effective, seeing reduction in grey squirrel numbers and the health of the remained grey squirrels within months. Not only that, it increases the number of our native red squirrels as they are quicker and therefore elude the pine martens, and their competition in the grey squirrels is reduced. Both pine martens and red squirrels are native and their reintroduction restores the natural balance as well as getting rid of those pesky grey squirrels! We should all be supporting schemes like these when they come our way. Grey squirrels love peanuts . We were suffering massive damage in our 6 acre woodland. The squirrels had chewed the holes to gain access in a dozen bird boxes and ate the eggs or chicks. Bark stripping the beech trees , and getting into the shed and chewing wiring . So we set up some feeding points (simple tables), and dispatched them using air rifles. With my family living in America, squirrels are regularly on the menu, I treated some friends to bbq squirrel. Before you wince , its just like chicken , and exceptionally nutritious. Francis, sorry to hear that you are having problems with grey squirrels stripping bark off an old tree like we have had on our estate, as mentioned above 3 years ago. The stripping continued but amazingly the Redwood tree, thought to be at least 80 years old, is still alive and putting out new leaves! I followed Reece’s advice and bought two cage traps from Amazon and caught and dispatched 14 squirrels this last winter, having previously trapped 9 in my own garden. During the winter I only had to use horse chestnuts as bait but that’s not working now. We had one squirrel left who has now called in a mate so no doubt there will be youngsters soon so will start trapping again in the autumn. This is the first year we have noticed the squirrels stripping the bark. The tree in question is over 100 years old and is a beech tree. It is at the back of our garden outside our garden fence. The tree has some other damage to it, I guess relating to its age, and am worried that damage by stripping the bark may result in the tree or part of the tree falling down. We have already had a large branch fall and damage part of the garden. What would you suggest we do about it? Recolonisation doesn’t always happen that quickly. It can take over a year in some woodlands. That’s how long it took for us and the wood is not too isolated. I live on a private estate, in a country town, where the properties are built around gardens which have many very large mature trees and shrubs. We have an abundance of birds and also grey squirrels! Two years ago the squirrels started stripping the bark off a very large specimen Redwood tree. They have now removed all the bark from top to bottom to a depth of about 4 inches! We tried culling with Warfarin hoppers but some residents objected so we had to stop. Live cage traps only caught pigeons instead! The squirrels (and increasing numbers of magpies)are also destroying birds’ nests, particularly blackbirds and thrushes, and we have seen a big decline in songbird numbers. Then there’s the local sparrowhawk who drops in for a meal……..help!!! If you would like help dealing with any pest species such as Grey Squirrel, rabbits, crows, wood pigeon etc. that are damaging the new trees, wild plants and biodiversity you are trying to encourage at the site. Mainly covering the North West and North Wales areas, but will travel. We offer a free pest control service using ferrets, long netting or a silenced air rifle depending which would be the most humane and appropriate in each circumstance. .Fully insured, experienced and respectful of all rules and conditions you can be assured of a professional service and approach at all times. Fully equipped including Land Rovers, ATV etc. If we could be of any use to yourselves on any of your sites in North Wales please do not hesitate to contact me on 0151 203 8609 / 07830 308607 to arrange a meeting at a convenient time and location for yourselves.